15 years in the foundations of physics taught me little about the universe and much about human behavior. I eventually poured my frustration into a book, which was published a few months ago under the title “Lost in Math” and which documents that bad methodologies survive in scientific communities simply because they enable the continued production of papers. While the foundations of physics are the research area that I am personally most interested in, its lack of progress arguably has limited societal relevance. Who really cares if we will eventually manage to quantize gravity. If our fruitless attempts at least entertain the masses, maybe that’s justification enough to finance string theorists. But the same problems exist in other research areas, and in some cases lives are at stake. In his book “Rigor Mortis,” the US-American science journalist Richard Harris has a close look at what is going on in biomedicine and drug development. You may think that my experience with physicists should have warned me, but really I had no idea. While I follow the popular science literature on drug development to some extent, it is certainly not a topic that I know a lot about. And those popular science accounts tend to be celebrations of the supposedly great breakthroughs, most of which we never hear of again. I was under the impression that since in the life sciences you can at least experimentally check hypotheses, it can’t possibly be as bad as in the foundation of physics. Well, I was wrong. 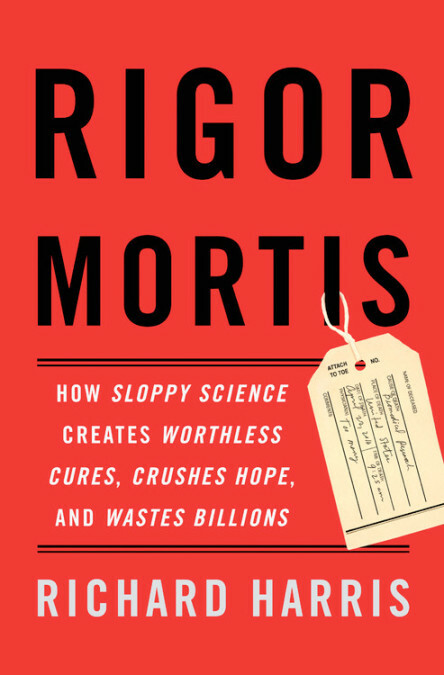 In “Rigor Mortis,” Harris goes through the various kinds of flawed scientific methodologies that have spread in those research communities. Poor experimental design, hypothesis-fishing, sloppy statistics, mislabeled cell-lines, contaminated but still used antibodies, the abundance of irreproducible results, outright fraud and misconduct, and long-retracted zombie-papers that continue to be cited nevertheless. No longer do I wonder why the development of new drugs has basically stalled and why the alleged breakthrough discoveries never pan out. Harris makes some efforts to convince the reader that the problem has been recognized and some people try to do something about it. While I appreciate the attempted optimism, that’s lipstick on a pig. Yes, there have been initiatives for this and that, and some of those have indeed partly addressed a specific problem. For example, requiring researchers to pre-register trials prevents them from later changing the hypothesis they were testing. But the overarching problem that the organization of scientific research is inefficient to the point of choking progress still exists and no one is doing anything about it. Harris book is thankfully short on the actual research studies, where I say “thankfully” because I get lost easily in elaborations about molecules with unpronounceable names and 20 different enzymes that may or may not be doing this or that. For me any article about drug development come down to “this thing fits into that thing and we hope it will have this effect.” Harris does nothing of that sort and instead focuses on the way research is pursued. I was also relieved to find that Harris largely spares the reader dreadful stories about patients who succumbed to their illness after long suffering. It’s not that I think those stories shouldn’t be told, they have their place, but personally I would prefer if popular science articles stayed clear of them. For me it’s a reason not to read an article if I have to fear someone may die in the next paragraph. Harris interviewed a few people whose voices appear in some places. His writing is clean and clear and easy to follow, which is to say he writes better than I, damn. It’s not a long book, but it’s full with information, and it’s scary. You should read it. "Harris makes some efforts to convince the reader that the problem has been recognized and some people try to do something about it. " I work in a hospital and attend meetings about medical research in the hospital. I see how those involved are aware of all these problems and do their best to adhere to the best standards. However, the best standard, randomised double-blind prospective studies is often impossible or unethical. Also, much research has to start, out of necessity, with less than optimal retrospective studies. In a clinical setting, doctors have to work with the information they have, even if they do not know for sure about the quality of these results. Many of the reported problems originate in the fact that society has delegated drug research to commercial, for profit, entities. The safeguards to counter the perverse incentives that result from this policy choice are always under stress. The standards are augmented continuously, generally, as a reaction to scandals as reported in the press. But rules will never be perfect. Thanks! Why am I not surprised? Practically every day I get emails inviting me to be a speaker and get my paper published at some conference on an implausibly wide range of fields. People must be responding to this rubbish. And that's in physical science! I create numerical models of a beating heart, to be specific. It is an area full of promise, neatly summarised in the expression "in silico testing". How wonderful it would be to be able to test drugs and treatments in a virtual computational organ personalised to you, rather than in an animal one or generic human one! How does this compare to numerical models in other areas of physics, say, cosmology? Is there also a lot of unsupported parameter cherry-picking in those? Is reparametrising numerical models (no new physics involved) to put forward new untested (untestable?) predictions OK, even common? "... its lack of progress arguably has limited societal relevance. Who really cares if we will eventually manage to quantize gravity." Could not disagree more with the statement. One might have heard something similar said in Maxwell's time. "Who really cares if we eventually manage to unify electricity and magnetism?" A few short decades later the entire world was being transformed by Maxwell's discoveries. We always underestimate severely how quickly and how radically society can change in response to new technological discoveries. Partially that is because we are encouraged from an early age to develop a temperament which values stability as a great social virtue. I don't know who or what you are disagreeing with, but please note that I am merely channeling what I think most people's attitude is to quantum gravity. I have explained here why I think that's a mistake. Oh cool. Wasn't aware of your speech/blogpost on this topic. Your thoughts there seem contrary to what you say here about the limited social relevance of the lack of progress in fundamental Physics. I guess you were being sarcastic here or perhaps it was meant as a jab at string theorists. I can be quite bad at picking up sarcastic cues in the written word sometimes! I haven't done a poll but I am pretty sure if you did you'd find that most people think cancer research is more relevant to their lives than research in quantum gravity. That's all I am saying. It's not sarcasm, it's realism. True. But we are not "most people". We are (presumably) experts. We should be able to discern the social significance of developments in our own field which lay people cannot. Speaking of cancer research, beakthroughs in quantum computation can radically change medical diagnosis and treatment for example. (If you ask how, I'll tell you) Breakthroughs in quantum gravity hold the promise of uncovering new ways of storing and generating energy. (Again, if asked I can elaborate how). These would have a direct impact on most people's lives. We shouldn't sell our own work short. If we do, then what reason will there be for anyone to trust us enough to give us funds to do research? I'm sure that whatever your personal beliefs about the broader state of science you would agree that we researchers need to feed from time to time! One might have heard something similar said in Maxwell's time. "Who really cares if we eventually manage to unify electricity and magnetism?" A few short decades later the entire world was being transformed by Maxwell's discoveries. Yes, there are unforeseen practical applications. Kepler worrying about 8 minutes of arc in the orbit of Mars led more or less directly to the Principia and hence the modern world. But that is not the main reason that fundamental research is done! And it can backfire if one tries to use this as justification to get funding or whatever. Arguably, the "impact statement" really cripples innovative research, and one can't get out of it by saying "I don't know, but maybe someday something will come of it". It is worth doing for its own sake. I apologize for the off-topic comment. By all means, please do! I suspect you're the victim of some hype. (1) You may find John Ioannidis' papers on reproducibility in medical studies fascinating. (See, for example, the paper "Why Most Published Research Findings Are False": https://journals.plos.org/plosmedicine/article?id=10.1371/journal.pmed.0020124 ) Ioannidis has published a number of such papers, and they've all largely been accepted by the community as true and then insufficiently heeded. (2) Here's a stunning fact: the medical community does not know if it is safe to give NSAIDS (like aspirin or ibuprofen) to people with high fevers. It does so routinely, but there has only been one controlled study attempted of safety, and it was terminated when it concluded the death rate in the treatment group was higher. That result was never followed up on. Numerous "obvious" things to study have never been studied. I a familiar with Ioannidis' work. I wrote about it eg here and here. Refereed literature is a managerial exercise. "Research" is process fluid. Any research that fills pre-written balance sheets is acceptable. Social promotion for the sciences! As Baby Boomers age their gums rot. opening broad vistas of ineffective bloody torture (like non-classical gravitation, only smaller). The cause and cure of periodontal disease are identified. Good luck on that ever happening. Cataracts are reversed with dispersed lanosterol eye drops (e.g., "Lanomax"). Veterinary Use Only. Physics has 10^723 "acceptable vacua" but cannot make an apple drop. Analytical chemistry can drop that apple! Good luck on that ever happening. 2) Binary thinking is a mistake: p < 0.05 and one declares "We have shown that X has a significant effect," or p >= 0.05 and one declares "X has no effect." In the kinds of complex systems studied in social science and biology, an effect of *exactly* zero is usually highly implausible; furthermore, the magnitude and even size of the effect could easily be context-dependent. Gelman advocates doing a full Bayesian regression analysis, with multilevel modeling for interactions, to instead get a range for what the main effect and possible interactions might be, with priors constructed based on previous research in the field. "If our fruitless attempts at least entertain the masses, maybe that’s justification enough to finance string theorists. " if individuals want to fund string theorists, fine. but government financing is another matter. government funding is based on taxation and by definition, taxation is theft (you may approve of such theft- but nonetheless, it is funds taken, not given, and hence it is theft). personally, i don't approve of theft for any reason and so i returned all of my research funding to the NSF and the state of Illinois after i received tenure (not before - a person's gotta do what a person's gotta do) and book writing supplemented my academic income.you might want to explore using this revenue stream ; it feels a lot better (to me) to earn money from individuals who are willing to pay. and fortunately for me, paper & pencil for theoretical research are inexpensive research tools. The relevancy of whether a successful quantum gravity/cosmology is developed may have a very long term impact. Certainly cancer is more important to people than quantum anything, and the same goes with the latest pop music, sports or celebrity event. I would say few people know anything about the popular culture of the early and late 17th century during the time of Galileo and Newton, but most have some awareness of these two and their science. When Newton laid down laws of mechanics that could predict the motion of planets science was found to predict the future in ways that religion could not, though it made prophetic claims. The impact at the time was enormous and seen in the so called intellectual enlightenment and the age of reason. It is hard to know if some similar cultural or social might occur with knowing quantum cosmology. I will say I suspect most people will hear nothing of it, though you never know. I think it is vital that scientists who see the problems in their own speciality, become aware of the problems in other disciplines. I'd recommend this book by an English GP, that picks apart some areas of medical science. Much of what he points out is hardly deniable - large patient studies that are there in the literature, but just ignored if they don't find what is wanted, and treatments that are used without any actual testing at all! Next time you need to visit a doctor, you will probably visit the internet first! My wife, though not a scientist, spent much her career working with and for medical researchers at a big university. And I think she'd agree completely with what @Rob van Son said, above. There are some great people in the field, and some not-so-great. The vast amounts of money dammed up behind these projects, and the bureaucracies they face, create a vise in which research people are squeezed pretty hard. The picture is complicated, but one element in it is simple - big drug companies are totally amoral entities. the development of new drugs takes lots of time and tens of millions USD just to get startedm, to get it in the earliest, cheapest (Phase I and IIa) clinical trials. (And t is difficult to get the investors money unless you already have some clinical data, so this is a vicious cycle. There is a huge incentive for the the management of a biotech to exaggerate and even manipulate the results to impress major investors or sell the company, then cash out and let the company overhyped clinical project burn out under the new ownership in a very expensive way. An easy to understand is the example of a (fairly successful) company that did a pioneering biology cancer research. They made an elementary super-expensive blunder of not testing their drug in human plasma (they used bovine and mouse and dog plasma, etc. because the animal research is done first, and getting human plasma is more expensive and there is paperwork to fill, so they did not bother to test it) and it turned out that the clinical candidate binding to human serum albumin in particular was so strong that it pushed the achievable level of free unbound drug below the therapeutic threshold. So the drug worked in dogs and mice but was disappointing in humans. Meanwhile, older and less successful drug candidate was limping along in the clinic, because of old unsolved formulation problems. The company was about to be sold but withdrawing the first drug from the clinic was a bad bad news. So as to sweeten it a little, the company claimed the second older drug candidate had some fantastic promise and poured a lot of extra cash into it, to impress investors, and kept this lousy candidate in the late stage (very expensive) clinical trials for 3 years, knowing full well it won't go anywhere most likely. But it wouldn't be their problems, they were just showing exciting results from the clinic with the older second candidate. There's this idea that science is infallible, and in the long term that's been true. Short term, there can be all sorts of blind alleys, intentional mis-direction (I read "The case against Sugar" ~1 year ago. (I an OK read, a bit pedantic.)) and other human mistakes. I worry about all of science, some more in the public view than physics. No longer do I wonder why the development of new drugs has basically stalled and why the alleged breakthrough discoveries never pan out. I would say that the VSV-vectored Zaire Ebola vaccine has panned out quite well, even though Canada got shafted on the deal and nobody bothered to trial it to the extent possible in advance. The next two targets are a universal flu vaccine and a new antibiotic; an example of the latter may have been turned up serendipitously from soil. CIDRAP and In the Pipeline are good places to follow this sort of news. >> No longer do I wonder why the development of new drugs has basically stalled and why the alleged breakthrough discoveries never pan out. Another nice example are the developments in immune therapy for certain cancers. At the one hand, there are remarkable successes with certain cancer types (mainly late stage melanomas) where groups of patients who were expected to die suddenly are cancer free for a long time (i.e., cured). However, quite a number of patients develop life threatening side effects and large groups do not respond at all to the treatment. How to communicate this extremely difficult puzzle to the public is a problem in itself. Dear Sabine, I'm wondering if your book "Lost in math..." will be available in e-pub (Kobo) format too. I want to say there is much great science done about the mechanisms of life. However, when one comes to improving life, that is where everything gets cloudy. Evolution has been going on for at least a billion years, with at least trillions of trillions of variations tried. This goes for societal evolution as well. There is not enough statistics to really define better, much less to actually make improvements, overall, to life. Tradition is our best guide to what works. An example of this is green tea and lemon. The combination is much better, now shown scientifically. So science is good, but it must be incorporated through evolution, in order to begin the long process of separating the wheat from the chaff. If you can determine death by rigor mortis, you should also be able to diagnose signs of life. Projects are finite but strategical thinking is a continuous process. For a further account of research bends twists and personalities in a less dramatic subject area I recommend " The Tangled Tree : A Radical New History of Life " by David Quammen. An account of research into the development of life's earliest forms with personalities and significant implications included. There is a noted lack technical jargon which makes it a relaxing but educational read. Almost 40 years ago, when I was in training to become a Cardio-Pulmonary Tech, I came across some editorials in the American Review of Respiratory Disease by Dr. Julius Comroe on this very topic. Sorry to say, there's nothing new going on here. "Comroe chose history as his method for conducting research in the process of medical discovery, calling his instrument 'Santayana's Scope' [hoping that] memories of past discoveries will inhibit repetition of false beliefs about medical research and prevent the adoption of ill-conceived and harmful public policies..."
Sabine wrote: No longer do I wonder why the development of new drugs has basically stalled and why the alleged breakthrough discoveries never pan out. I'm curious if the author actually tries to argue that progress in medical science has stalled due to sloppiness and waste. I'm a reader of popular science articles and books, and it's my general impression that the low-hanging fruit for breakthrough drugs have been picked. But is it fair to say that progress has "stalled"? For that matter, what is a breakthrough drug? I saw a television advertisement about a breakthrough drug for treating late stage lung cancer. The ad showed various older folks having a good time with their families and friends. There was no hint of disease and it appeared that they had been cured. One day I decided to enlarge the fine print on the bottom of the screen. It said that in clinical trials, patients taking the drug lived an average of four months longer than patients who didn't take the drug. There was nothing about the alleviation of debilitating symptoms, so I'm guessing that real patients aren't having quite as good a time as the actors in the ad. Indeed, it's possible that the additional four months of their lives are not very pleasant. Of course, it goes without saying that this breakthrough drug is very expensive. I turned to my wife and said, "Even if my health insurance would pay for that drug, I wouldn't take it just to live another four months with lung cancer." Sabine wrote: Scientific research is inefficient to the point of choking progress and no one is doing anything about it. Again I'm curious if the author argues this point in the book. Sloppiness and waste certainly slow down progress, but is it "stalled" and "choked"? In a more general sense, I think it's too early to worry about a lack of progress in science (including physics). Maybe we're on the right track but on a plateau. Maybe we're reaching the limits or contradictions of an incorrect or incomplete paradigm. If we haven't made significant progress in 200 years or so, I might start to worry about a lack of progress. In the meantime, I'm confident that we are addressing problems like sloppiness and waste in an incremental fashion. I worry more about other potential threats to progress. Sadly, there is a chance that we will destroy ourselves or our environment, making us nostalgic for mere sloppiness and waste. By the way, right now my wife and I are suffering from miserable colds. I still remember the hope and excitement I felt in the 1970's when Linus Pauling announced vitamin C as a breakthrough for the treatment and prevention of diseases ranging from the common cold to cancer. Since then, I've learned about sloppiness and waste in scientific research. And yet, we've made progress since the 1970's. George wrote: I read "The Case Against Sugar" about a year ago. It's an OK read, a bit pedantic. For decades I've seen research about the case against sugar. I think it's been clear for a long time that eating lots of sugar isn't healthy, so in that sense the case no longer needs to be made. Gary Taubes does a good job of revealing the sloppy and sometimes deliberately misleading "science" of nutrition research that favors Big Food. However, I find fault with Taubes when he goes too far. For example, I think it was in "The Case Against Sugar" that he suggested small quantities of complex carbohydrates can be harmful, even a serving of spinach. He offered no evidence to support his claim. As you know, Taubes focuses not just on the harmful effects of sugar, but also the beneficial effects of healthy fats. Nutrition suffers from sloppy scientific research. With the stakes as high as they are - epidemic rates of obesity, diabetes, osteoporosis etc. - you'd think we'd get a little more serious. On the other hand, maybe we could follow the Pareto principle: If everyone stopped consuming excess amounts of sugar and got plenty of exercise, maybe we'd get 80% of the health benefits. Would that be a breakthrough of sorts? I did a chemistry degree followed by a PhD. At one point my supervisor and I were faced with the fact that our results were in conflict with an existing paper in the field. To make matters worse, the author of that paper, was giving us access to a high field (for the early 1970's) NMR machine. We discussed the discrepancy with him, and persuaded him that his paper was wrong. In return we added him as an author on our new paper, and everyone was satisfied. This seemed to be exactly how science was supposed to work - we helped the other guy out, but ensured that the scientific record was put straight. I moved elsewhere to start a postdoc, and after a while I and a senior academic on sabbatical went to see the head of department about two serious flaws with the equipment. After a little prevarication, the department head admitted that the flaws were really troublesome, but insisted that he would do nothing until after his two PhD students had finished collecting their data - maybe a year in the future. This left me with a very disillusioned view of science as it is really practised, and I moved sideways into software development (only partly because of this incident). Since then I have felt the real problem with modern science is that there are too many ways in which it can become dishonest or sloppy. People working for a large, expensive experiment - the LHC and LIGO are obvious examples - must be under intense pressure to 'succeed' and to cut corners. Retracting a key paper must be intensely painful. As a result, I have very little faith that they are contributing anything to scientific knowledge. I have no idea how this problem can be solved, except in areas where failure cannot be disguised, such as engineering! The book is available for Kindle. "On the other hand, maybe we could follow the Pareto principle: If everyone stopped consuming excess amounts of sugar and got plenty of exercise, maybe we'd get 80% of the health benefits. Would that be a breakthrough of sorts?" Even though I am not a nutritionist that sounds like excellent advice. However, that result didn't come out of decades of nutrition research, it came from common sense! The trouble is that so much science in this area seems to be extremely uncertain, take for example the recent claims about red meat causing cancer. What you do not hear, is that experiments done on rats only work (sort of) if you give the test rats and the control rats a dose of carcinogen to prime them! I presume that without that push in the direction of cancer, it would be necessary to test a vast number of animals to see any effect. There are some departures between drug research and physics, particularly foundations of physics. Corporate power is far more present, and the pharmaceutical companies command great influence. If pharmaceutical companies participate in such research in any way they often take patents on the whole project, even if public money was entirely spent on the work or if the leading researchers were academic. With quantum gravity you do not have that sort of thing. That seems reasonable; humans can’t go a day without getting a dose of some carcinogen! I respect your opinions. I am also reading the book written by you and am looking forward to become a person like you who sees everything with an open mind and knows what's actually going on in her field. I just found a review of your book on a WordPress blog. Common sense may have come up with the idea (that and a dozen bad ideas) but only research can tell if an idea is valid or not. "No longer do I wonder why the development of new drugs has basically stalled and why the alleged breakthrough discoveries never pan out." Just wait until you get cancer and you will be happy that you are wrong about this. I'd just like to add, that I am reading "Rigor Mortis" right now, and it is indeed an eye opener. Academic science (as opposed to work done in pharmaceutical companies) seems to be particularly troubled. If I still worked in academic research, I think I would find the book quite painful to read! Thanks to Sabine for finding this. Phillip Helbig: I did, and I was. Maybe 30 years ago I would have been puzzled, perhaps shocked about these statements. After 30 years in profession as a membrane developer (here as a field of separation technology) more and more a sensation of frustration takes place about the finding that STEM is not that far away from esotericism and woodoo. It seems truth is a kind of agreement among members of an ‘in-group’ of scientists. If you want to be part of this in-group, invited to its regularly meetings somewhere on nice places of this planet, you should better agree with even absurd but accepted theories. For example I discovered in 2003 that polyethyleneglycol (PEG) – a water-soluble polymer, commonly well-known as completely harmless part of hand lotions and tooth pastes, is able to solve polyethersulfone (PES), known as a high tech thermoplastic for clinical purposes (autoclavable) and basement for many ultrafiltration membranes. When I tried to discuss this phenomenon with internationally accepted experts in membrane technology I was reprehended that PEG is a non-solvent to PES as I can read in all publications and books. Even a homogenous and viscous blend of both polymers directly in front of them didn’t convince them. PEG is still to date known as a non-solvent to PES. This is one but not the only example of scientific objectivity I got in my professional life. It comes down to the fact that it is far more profitable to the Corporations in Pharma to sell 'treatment' in order to 'control the symptoms' rather than to actually provide a cure. Even more profitable if the 'treatment' happens to cause side effects that can be controlled with other medications. Sad fact is that it is not conspiracy theory, it is facts concerning the existing and well practiced conspiracies that now operate in plain sight. If there is a buck to be made, or a bunch of em, there is someone willing to take the risk and play it off as normal. Effects down the line, not directly related to them get overlooked in the data and the Company does not care as long as operating costs stay profitable and the shareholders happy. While some of us have been crippled for life by our Corporate Industry mentality. They made great profits off me, until having spine crushed, rebuilt and then being past my 'pull-date'. So now I armchair officiate, apologies in advance.